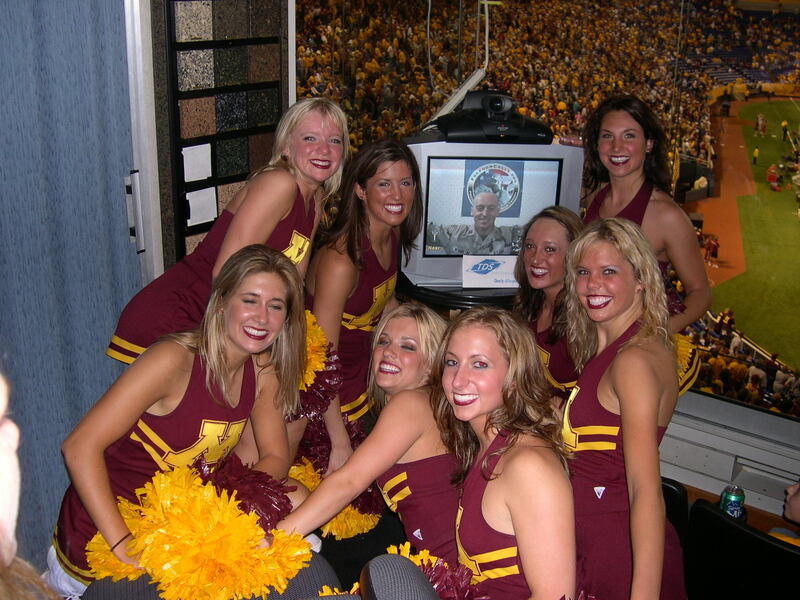 US Marine in Iraq hugs a group of Minnesota Gopher Cheerleaders in a luxury suite at a 2005 football game. Nobody cared who won the game after that. The original Operation America Cares started in Minnesota in early 2005 at the height of the Iraq war with a mission to connect military families at home over Internet video conference links with loved ones serving overseas. Infrasupport helped start up the original OAC and provided technical expertise and some of the equipment to run several video events, partnering with the Minnesota Twins, Vikings, and Gophers, St. Paul Saints, St. Paul and Northern Dakota County Chamber of Commerce, Eagan Hills Church, and others. This effort generated quite a bit of press coverage, some of it preserved here. By 2010, most of the original OAC founders and corporate sponsors had moved on and OAC was dormant. Enter an energetic group in the San Diego area. Not knowing about the dormant Minnesota OAC, the group in San Diego started up another, independent organization also named Operation America Cares with a mission to send care packages to the troops overseas. Through the miracle of the Internet, the San Diego group found the Minnesota OAC and reached out. The Minnesota OAC officially dissolved and gave the San Diego OAC its blessing, name, logo, and any other technical assistance required to further its mission. Today, the San Diego OAC is thriving and has packed and shipped thousands of packages to the troops. Although Infrasupport is no longer officially involved with the current OAC, we like to think we played a role getting it started. Greg Scott of Infrasupport and the founder of today’s OAC still contact each other occasionally and each has a standing invitation to visit the other when traveling in the other’s state. Contact us if you want to help OAC and we will put you in touch with the right people.